Are you accountant? Are you studying for becoming accountant? Are you interested to open your new accounting service business. Are you interested to grow yourself as accountant? Are you disappointed from your accounting career? Are you thinking about give up your accounting career and start to focus any other area of career? Did you leave the job of accountant? Did you give up your all hope in accounting profession. If any of above answer is yes. This content is really for read. Read it for two times. It is my request. Because from one month, I did not write anything. So, today, I focus to write for your life time benefit content. So, I chose this concept. All above question are so important for you and you have trust to do something in the field of accounting. But you did not know how to grow? This is biggest question. Now, I solve it with following way. For growing as accountant, you need to set the goal. You should know its step. Take a Your Goal Blank Note book. Take its first page. Write, I want to earn Rs. 10,00,000 per month as accountant. Many of them will not write this goal because from last 10 years, they are earning just Rs. 10000 to Rs. 15000. How can it possible? It means, they have no self-confidence. It means, they do not have the trust in themselves. It means, they have made just machine like animals after getting higher education. One of the great thing in this world that God has made you as a machine that what you think, you can achieve. What you set the goal, you can achieve the same goal. What you will have the vision, you can achieve the goal. Your desire will give the performance near to you. You just desire same amount. You just write the same amount in the blank paper. You just start to think same amount. You have to fix that you have to earn same amount from your accounting business. The world business is more than $128 billion regarding accounting. So, to earn 10,00,000 per month is very small goal. But you are seeing it very big because you have the habit of thinking small. You have to make your habit to think big. Now, evaluation of goal is very important step. What can you give. Answer is very simple. You can give your own time for this accounting business. You can dream it as sale business. You are providing the service of accounting. You are selling your service. Just to think to spend your own 8 hours is not sufficient. Every big money which you want, you need to give big service. Are you ready for this. Normal Indian Accountant is earning = Rs. 20000 per month. Now, you have the business of providing accounting service to all the business. 50 Accountant's service in the market. But you need also to pay other infrastructural expenses. 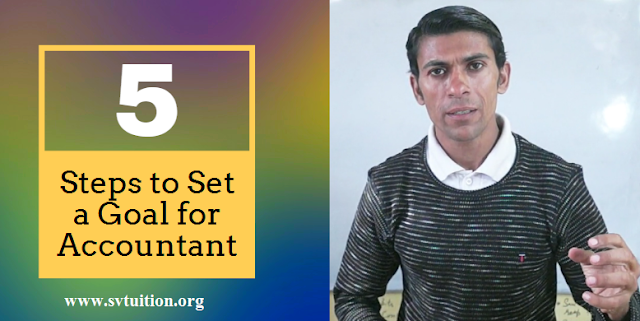 So, you have to make the goal of 100 accountant's appointment. It means, you will achieve your biggest goal of Rs. 20,00,000 per month by appointing 100 accountant in your accounting service business. Rs. 20,00,000 will go to the salary and Rs. 10, 00,000 will go to other infrastructural and operating expenses. In these expenses, accounting software buying, rent of building, refreshment cost and internet bill and mobile bills. Because you are dreaming this biggest goal not all the accountant. Because you are developing your this new skill not all the accountant. Because you are making your this habit not all the accountant. If you have to achieve goal, you need to pressure on your potential like a body builder pressure to his muscle by workout after few seconds. It will help to develop muscles. As per my thinking 3 months are sufficient for this. Goal with time deadline, there is no value. because you did not fix it, it means, you will not achieve it. Plan is sub goal and it is the step of stair which will help to achieve your goal. Read my ebook " 100 steps to success" and you will find there are lots steps which you need to take. Without plan you will never achieve any goal of your life. You can say and write in your blank page. 4. I will buy second hand machines or new machines and equipment. 6. I will take debt for this. 9. I will pray to god for new ideas of better steps for achieving my goal. 10. I will focus on my goal. 15. I will read more and more about self-help for achieving my this goal. Read our motivational ebook " The Greatest Accountant of the World"
16. I will learn accounting skill by doing online accounting course. 19. I will write the thankful in my notebook who has supported me in this area. 20. I will be positive during all the time of my action. You will never take any of above action because you did not remember all these steps. So, you will write in blank notepaper. 6. I will take the actions and repeat the action about the steps of my goal.